Brookland Bed & Breakfast Now Open! 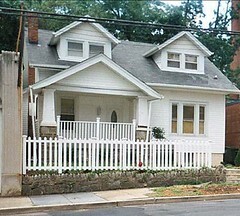 David Fox has opened up the Brookland Bed & Breakfast, located at 3619 12th Street, NE. The B&B offers 5 double rooms and 1 single room at $85/night for the single and $95/night for the double; rooms are reserved via reservation only. For information or to make a reservation, please call 202.315.8714, or e-mail David at david@brooklandbandb.com. On Monday, June 18th, 2007, the home of Saymendy Lloyd-Neal (Chairperson of the Coalition of Concerned Neighbors) and Paul Neal caught fire. Unfortunately, they lost many possessions, but there was no loss of life. Traditionally, the Lloyd-Neal's are givers and don't ask for anything in return. At this time, it is humbly requested that we honor their selfless spirit of giving and make a donation in the form of a gift card for any amount from one of the following stores: Target, Walmart, or Sears. Just a reminder that only two brunches are left! Have you been yet? If so, what info/updates can you share? Also, what would you say if I told you I'm planning on creating an organizational plan for a Community Development Corporation/CDC or Main Street Program for the Rhode Island Avenue NE commercial corridor in Woodridge, 18th Street to Eastern Avenue....Any interest in collectively working to revitalize the broader area to benefit the community? 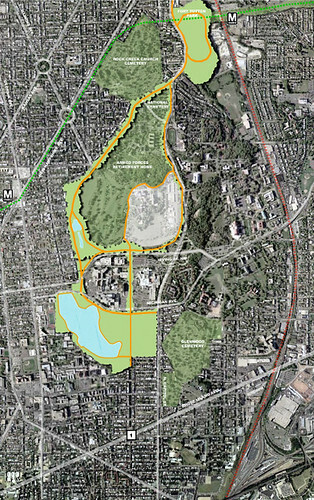 What: The DC Office of Planning invites the public to participate in a community workshop on the Draft Concept Plan for the Brookland / CUA Metro Station Area Plan. There will be a public meeting in July to present the results of this meeting. Just 24 hours after a homicide in Carver Terrace. Police said a man was found suffering from a gunshot wound Wednesday night in northeast Washington. Police officers had responded for the report of a shooting just before midnight in the 900 block of 19th Street. Officers found an adult male who had been shot in the back. Authorities said the victim was conscious and taken to a hospital for treatment. There has been no word on the victim's condition. At approximately 10:50 last night, Tuesday, June 19, 2007, police were called to the rear of 1211 18th Street, NE, for the report of the sounds of gunshots. Upon arrival they located 20-year-old William Marquez Aull, of the 1600 block of Trinidad Avenue, NE, suffering from apparent gunshot wounds to the head and upper torso. DC Fire Department emergency medical personnel responded to the scene but found no signs consistent with life. He was taken to the Office of the DC Medical Examiner and pronounced dead. * Note: The audience is asked to wait until recognized by the Commission Chair before making comments and to limit question/comment to 60 seconds in order to give others an opportunity to be heard. Every effort will be made to recognize all, but only one person will be recognized at a time. Thank you for your cooperation. Etc. : The Coalition of Concerned Neighbors meets the third Monday of each month. For questions or concerns, please contact Ms. Lloyd at 202.903.6197 or Mr. Neal at 202.257.0001. You can also contact the Coalition at 202.882.1683 or concernneighbors@aol.com. data, using formula, simple functions, and graphing with Excel. Windows XP file management, word processing with MS Office WORD, spreadsheets and graphing with EXCEL, and an intro to POWERPOINT. Prerequisite: PC Beginners or placement test. HyperText Markup Language is a script used to construct web pages. HTML 1 teaches bare bones construction of a web page, font, color, lists, and tables to control the placement of elements on the page. Prerequisite: Keyboarding, File Management (PC Beginners) and Word 1. Personal computing for beginners on Windows XP. Mouse basics, managing files and folders, using a typing tutorial, cut and paste, e-mail, and internet search. Word processing using MS Word 2003. Editing text and formatting text at the character level, paragraph level, and document level, graphics and templates. Prerequisites: Keyboarding and PC Beginners. Byte Back is a nonprofit 501(c)(3) organization providing high-quality computer training to low-income residents of Washington, DC and the surrounding area. What: Join the NE DC Historical Society as they continue to explore the history of our Northeast Washington communities - past, present, and in years to come. This month the community focus will be "The Rhode Island Avenue Corridor." The host will be the Premier Community Development Corporation with Hazel Thomas, Chairperson. · "The Present Status of the Rhode Island Avenue Business Corridor" by Beyla Adero, Proprietor of Nature's Rhythm. · "An Open Community Share of Your Reminiscences on the Businesses along the Rhode Island Avenue Corridor", including parishioners and friends of St. Francis de Sales Church. Everyone, of course, is welcome to come and share their memories! Etc. : For those unable to attend this meeting, don't miss next month's meeting to be held from 2-4pm on Sunday, July 8th, 2007. We will have a special "H Street Encore Presentation." Our meeting will again take place at the Atlas Performing Arts Center, Laboratory 1, 1333 H Street, NE. Presentations will include "The History of Union Station" by Bill Wright (postponed from May), "The History of the Uline Arena" by Richard Layman, and more. Join Washington Central Parks this Sunday, June 10th, 2007, for its third Walk Fort Totten Park! If you’ve missed the prior two, now’s your chance - before it gets too hot - to learn about the natural landscape, plants and geology of this wonderful gem in Washington’s Emerald Necklace. We will meet at 12:30pm in front of the Hitching Post Restaurant, across from the entrance to the Armed Forces Retirement Home/Old Soldiers’ Home, at the corner of Upshur Street NW and Rock Creek Church Road. No rain date. community in this important endeavor. PLEASE JOIN US TO REOPEN WASHINGTON CENTRAL PARKS – NOW! For more information, Contact Reyn Anderson. Dance Place is partnering with Wohlfarth Galleries, Roxanne's ARTiques & Gallery, Washington Works on Paper, and Colonel Brooks' Tavern for Saturday Night Out in Brookland, a new venture offering multiple discounts each Saturday beginning on June 2 and ending on August 11, from 5-8pm with Dance Place performances beginning at 8pm. Don't miss this opportunity to enjoy a summer evening in Brookland with dinner, visual arts and performing arts, all at affordable prices! Mention Code: KEEP MOVING to obtain your discount. Saturday June 9th, 2007, 10 a.m. - 6 p.m. 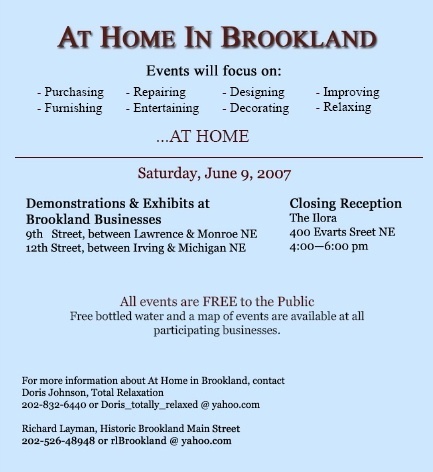 The Historic Brookland Main Street program and businesses in the Greater Brookland neighborhood are sponsoring "At Home in Brookland," on Saturday, June 9, 2007, from 10:00 a.m. to 6:00 pm. Events will take place on 12th Street NE, Brookland's main commercial corridor, as well as on 9th Street NE, with complementary events in other parts of the neighborhood. 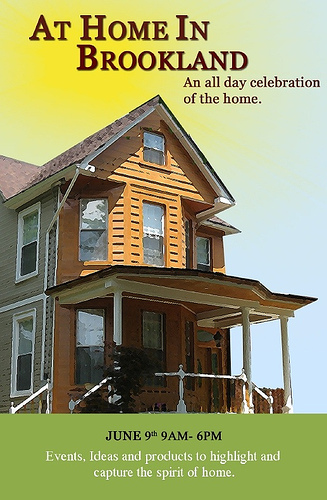 "At Home in Brookland" will feature events, demonstrations, and products to highlight and capture the spirit of home. Events will focus on purchasing, designing, furnishing, decorating, improving, repairing, entertaining, and relaxing at home. - and the week long DanceAfrica event at Dance Place, the community and regional arts center devoted to the presentation and expansion of dance, 3225 8th Street, NE. WALK THE BROOKLAND MILE: Community members are invited to put on their comfortable shoes and "Walk the Brookland Mile" to meet and greet local business owners and their neighbors, while exploring all the goods and services locally available for their home. Use the list below to locate participating businesses or look for the white tents or green, yellow, and blue balloons that mark the business locations. All participating businesses will have free bottled water. Keller Williams will hold an open house with free credit reports and Home Value Reports and will have a Moon Bounce for the children. Visit Total Relaxation for a highly coveted Gift Certificate or for candles, soaps, and lotions to help you relax. Events include free Mini-Spa Treatments. Visit Basements & Attics, a re-sale/consignment furniture and home accessories shop. Proprietor Norvell Jackson invites you and your family to investigate new arrivals. Frame a family picture or special work of art at Classic Framing & Art or choose a work of art from their own collection. Brookland Hardware will be demonstrating an environmentally friendly, no chemicals carpet cleaning machine-the new Host Dry Carpet Cleaning System. Host can be used on all types of carpet, including wool and sisal. Dwellings will feature demonstrations throughout the day on entertaining at home, featuring wonderful tapenades and other gourmet treats. The Johnson pavilion will feature workshops on paint colors, building green, and renovation ideas. Petals, Ribbons, & Beyond will be holding an outdoor tent sale, with birdhouses, plants, and summer wreaths. From 12:00 noon to 3:00 pm, visitors can learn the art of making a flower centerpiece. Those wishing to take a centerpiece home may do so for $15.00 (for flowers and container). Menkiti Group will host the closing reception at the Ilora Condos from 4-6 PM with remarks by Councilmember Harry Thomas, Jr. as well as refreshments, a raffle drawing, and an opportunity to tour the first fully renovated Ilora condo unit. For more information about "At Home In Brookland," contact Richard Layman, Interim Program Manager, Historic Brookland Main Street program, at 202.526.4848, or by email at rl.brookland@yahoo.com. Come one, come all...The fire station is located at 1227 Monroe St, NE. DCTV cordially invites you to attend its 20th Anniversary Celebration Saturday, June 9th. DCTV will host an all day extravaganza of food, workshops, entertainment and games for the entire family. The all day event will be held at Brooks Mansion. A reservation is required. In conjunction with DCTV's Media Access Day / 20th Anniversary Celebration. Stop by for free classes on various topics and kids activities from 10am-5pm. There will also be free computer recycling from 10 - 4. This is an opportunity to clean your house of that old computer equipment and dispose of it responsibly. We are especially looking for monitors - an organization that sends computers to Tanzania will be collecting the monitors. If you have any questions, please contact Patricia M. Jayne, Executive Director at pjayne@byteback.org or 202.529.3395. DanceAfrica, DC 2007 will run from June 4 through June 10, 2007. DC's 20th annual festival celebrates the dance and music of the African Diaspora. The vitality and richness of African culture is experienced through dance, music, visual arts, food, clothing and crafts. Through master classes, outreach to school children, a performance series and an African Marketplace, DanceAfrica, DC promotes a greater understanding of African culture and illuminates its importance to this city and the nation. The festival is hosted by artistic director and festival Griot, Chuck Davis. blocks from Brookland/CUA red line subway station, free and convenient parking. Evening Performance Tickets: $30 day of show, $25 in advance, $10 children 17 and under. To purchase tickets, call 202-269-1600. The Metropolitan Police Department, Fifth District will sponsor an Open House. Our theme is "Working Together for a Safer Community." We urge you to come and see the Fifth District in action and join us for a day of fun. The event will include tours of the Fifth District, informational displays, a moon bounce, senior games, music, food and much more. For more information, please contact Fayette Vaughn-Lee at fayette.vaughn-lee@dc.gov or 202.698.0188. Yup - that's me. Thanks to the Post, Christina Breda Antoniades, and Dayna Smith for highlighting just a snippet of the hyper-local coverage neighborhood bloggers offer the DC area. I've been out of town for work the past four days, so it'll take me a bit to catch up on email, RSS feeds, and posting....then I'm off to another conference! June will be somewhat bumpy around here, so thanks in advance for your patience. Etc. 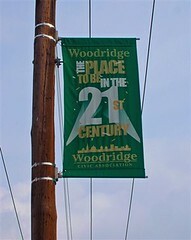 : A reminder that the Woodridge Civic Association meets the first Tuesday of the month, except July and August, at the Washington Center for Aging Services. » The Brentwood Community Civic Association meets at the same location, 7:30-8:30pm.